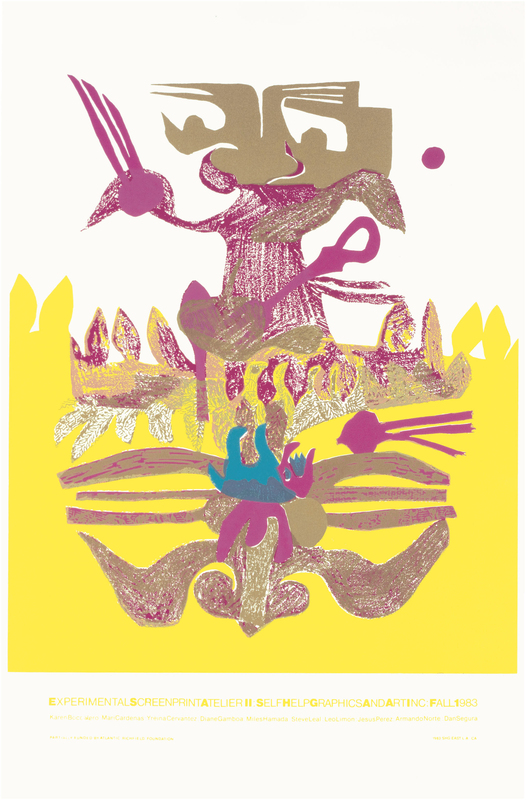 This five-color serigraph depicts various abstracted motifs, of which birds in flight and tree branches are the most prominent. In Our Remembrance/In Our Resurrection was printed at Self Help Graphics and Art, which Sister Karen Boccalero founded in 1970 in an effort to give Latino artists a space in which they could both produce and exhibit their work. Self Help Graphics continues to offer workshops to youth and emerging artists in the community. "In Our Remembrance/In Our Resurrection." Now Dig This! Art in Black Los Angeles, 1960–1980 Digital Archive. Los Angeles: Hammer Museum, 2016. https://hammer.ucla.edu/now-dig-this/art/in-our-remembrancein-our-resurrection.